Sid and Susan Stevens own the building at First Avenue and Ellsworth Street, where Sid Stevens Jewelers occupies part of the ground floor. On Wednesday Sid gave me a tour of the second floor and the house on the roof. The Bikman Building went up in the mid-1920s. Sid told me of a photo that shows the site being excavated for the construction, with the newly built Ellsworth Street Bridge in the background. The bridge was finished in 1925. Some time after 1928, the Bikman family built the house on the roof. Joseph and Anna Bikman and their five children lived there for a while until they moved to a regular house, on the ground this time, elsewhere in Albany. The penthouse must have been a neat place to live, if you didn’t mind the daily climbs up and down two steep and long flights of stairs. The penthouse windows afford wide views of the Willamette River to the north and across Albany’s rooftops to the south and west..
After the Bikmans moved out, the house was rented for a time. Now the place has been unoccupied for years. The roof leaks and household and construction debris covers the shag carpet. 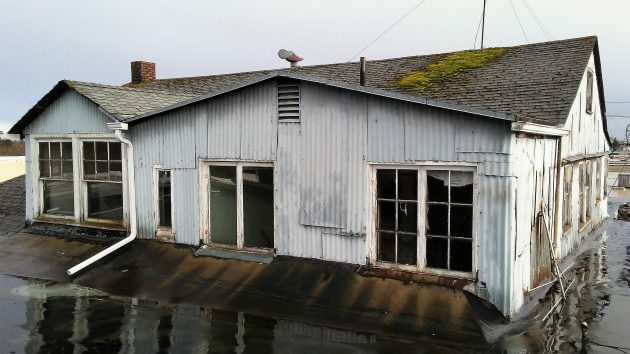 Seventeen years ago a tax assessor noted that the place was unlivable, and from the state of it now, he wasn’t kidding. An arsonist had set a fire up there not once but twice while renters were moving in and out, Stevens told me, and the damage can still be seen. Stevens has plans to have the roof and siding of the penthouse replaced this summer. 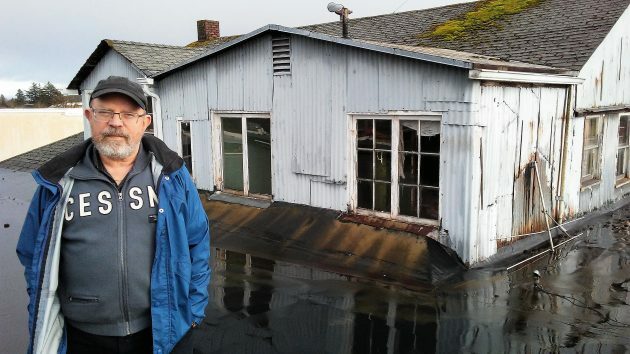 When I wonder why he doesn’t just remove the structure from the roof, he says he doubts that the city would let him. It’s probably historic, after all. Sid Stevens says he intends to replace the penthouse’s siding and roof this year. 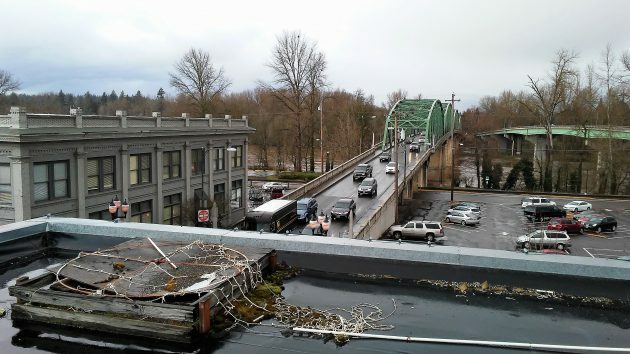 The view of the Ellsworth Street Bridge, which is about the same age as the Bikman Building. 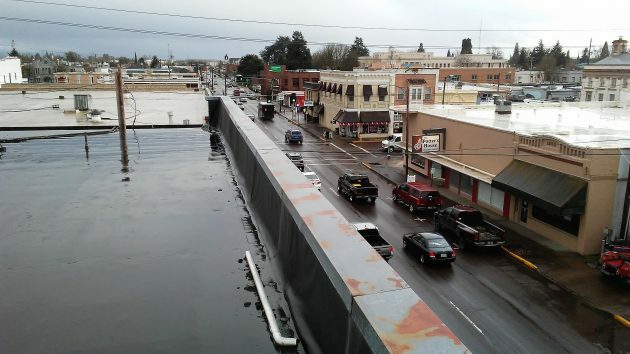 Ellsworth Street, looking south from the Bikman Building’s roof. Wow! It looks like hell in the your close up pics, HH. Death warmed over. My jaw is still on the floor after this fun blog entry!!! The pics are great! Especially the one looking back at Ellsworth bridge. Decades of neglect. Such a mutant structure. I’d love to see this place restored. Any pics from the inside? I would love to see pics of the inside!! I always wondered growing up about the house on top of that building downtown. Thanks for this fascinating story. I would gladly carry my bike and heavy grocery bags up twice as high … if I were deaf. Look at those hundreds of cars and parking spaces within line of sight, and therefore pretty-much line of sound. Roaring and rattly pickup trucks accelerating up the bridge carrying nothing but the driver. Hundred decibel horn blasts just so some idiot knows their car is locked (hey jerk, how about looking at your flashing taillights instead?). My heart is with the New Urbanist movement. But, until they finish the job and eliminate all cars, the only place I would live downtown is far underground. Actually, up there, it’s pretty quiet. Back in1960-61 my dad and I lived in the Bikman Apartments. . Fond memories. I was in high school and I loved watching people and cars down on the streets. We were lucky enough to have lived in three different apartments. At night I watched the night life. People going in and out of the old Westener. I think it’s a treasure. I too for 40 years + always wondered what it looked like. It’s better from a distance on the bridge. Lol restore it and let it be lived in again. So awesome. Thanks for sharing the story. Mystery now solved….. I LOVED seeing this house as a kid coming over the bridge. It was always there to anticipate for the split second it came into view. I can’t believe that 4 kids lived up there Great post! From the ground, it looks pretty rough on the outside. The berm is an interesting water-control feature. The siding looks like it’s been pieced together. Could that be transite? Do I remember correctly that Bikman was an immigrant tailor fleeing pogrom in Ukraine?